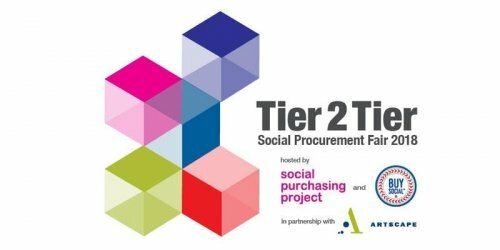 The Social Purchasing Project and Buy Social Canada are presenting Tier 2 Tier: Social Procurment Fair 2018. This event has as aim to help the creation of connections between corporations, gouvernments, and anchor institutions with social enterprises and other certified diverse suppliers. You probably do not want to miss this event if you are a purchaser looking to diversify your supply chain or enhance your organization’s corporate social responsibility, or a social enterprise looking to grow and increase your social impact. This is a great opportinity to make business-to-business connections across all tiers of the supply chain. The event also includes great food, drinks, film sreening and Artist Studio Tour. Entrance is free but please register now to attend. The registration deadline is Nov 26, 2018. See you at 2:30 on Nov 28 at Artscape Daniels Lauchpad to improve your Social Procurement! For additional information, please contact Alexandra Mutinelli-Djukic at adjukic at uwgt.org or 416-312-6315.